Fealty to the British monarchy is an anachronism and a drag on Canadian foreign policy that confuses many and delivers little. This phrasing, as well as his derisive references to “‘our’ throne,” suggests that Heinbecker believes that the one and indivisible Imperial Crown of the 19th and early 20th centuries still exists, when in reality it has long since multiplied out into a personal union of several Crowns vested in one natural person. The phrasing “Canada’s Place in the Monarchy” also implies that the Crown of Canada is a foreign object from which Canada can detach itself. In order to prove this argument, Heinbecker would have to demonstrate that the United Kingdom has determined Canadian foreign policy throughout the 20th century and that Canada does not possess a separate international legal personality. However, Heinbecker’s own examples in fact prove the opposite position, that the Crown of Canada is a separate legal person from the Crown of the United Kingdom (as part of a personal union) and that Canada therefore does both possess and exercise its separate international legal personality. In the next paragraph, he exalts the Government of Canada’s achievements in foreign affairs, in many of which he played a role. He described his experience in the Foreign Service in positive terms. Canada was regarded as the most successful country on the planet in integrating foreigners into our society and making diversity a strength, all the while safeguarding the rule of law, protecting the interests of our minorities, albeit with some regrettable lapses with respect to aboriginal Canadians, and promoting progress abroad. As Prime Minister Mulroney’s foreign policy adviser, I saw the high regard with which Canada was held overseas in fighting Apartheid in the Eighties and in promoting German unification in the Nineties, often in conflict with London. As Canadian Ambassador to the UN, I saw the respect Canada enjoyed when Prime Minister Chrétien withstood British (and American) pressure to join in the catastrophic 2003 Iraq war. In international relations, fealty to the British monarch delivers us precisely zero benefit in the conduct of Canadian foreign policy and at the same time associates us with a checkered British colonial legacy. If that case, how on earth did Canada realized those achievements from 1984 to 2003 that he mentioned in the earlier paragraph? Heinbecker cites the legacy of British colonialism and decolonization in Africa, India, and the effects of the Skyes-Picot Treaty of 1916 on the Middle East as examples of British Imperial baggage that somehow hinders the conduct of Canadian diplomacy. But Heinbecker offers no evidence that this legacy has affected Canada’s foreign policy in Africa or India. Invoking the Sykes-Picot Treaty is particularly bizarre, given that both the British and the French used it to carve out their respective spheres of influence and administration of the crumbling Ottoman Empire. How has Sykes-Picot affected the conduct of Canada’s foreign policy in the Middle East? Perhaps one example comes from the Suez Crisis and Canada’s peace-keeping force. Egyptian President Nasser initially objected to Canada’s participation in the United Nations Emergency Force (UNEF) because “Her Majesty’s British troops were replaced by Her Majesty’s Canadian troops.” Nasser also apparently objected to the Royal Canadian Navy’s White Ensign, which was identical to that of the Royal Navy at the time, and to the Red Ensign, which contains the Union Flag in its canton. (As Prime Minister, Pearson did away with the Red Ensign and replaced it with the Maple Leaf). Despite Nasser’s initial objections, Pearson’s efforts paid off and Canada became known for her peacekeeping efforts throughout the Cold War. And even if this case falls under Heinbecker’s category, focusing on the Crown of Canada misses the larger point that Prime Minister St. Laurent opposed Prime Minister Eden’s disastrous invasion of Egypt under the guise of protecting the Suez Canal; as with those earlier examples, the Queen of the United Kingdom and the Queen of Canada took different positions because each country has a separate international legal personality. Perhaps Heinbecker is correct. But in order to prove this claim, he would have to demonstrate that Canada’s status as a constitutional monarchy and the personal union of the Commonwealth Realms have someone prevented the Government of Canada from pursuing its desired diplomatic objectives. If anything, Heinbecker’s own examples on Canada’s diplomatic success between 1984 and 2003 point to precisely the opposite conclusion! And even if Heinbecker is correct, a few diplomatic kerfuffles do not make a good argument on why the Dominion of Canada should reject its inheritance and become the First Federal Republic of Canada. Even if Canada were a republic now or had been a republic in the mid-20th century, we will never be able to erase our history and the fact that Canada was once a British Crown colony. Heinbecker recounts an event that occurred during his time as Canada’s Ambassador to Germany. The Queen of the United Kingdom visited Bonn (the capital of the former West Germany) in order to promote British businesses in Germany. Heinbecker thought that the Queen should also act in her Canadian capacity and promote Canadian businesses at the same diplomatic event, so he asked the aide-de-camp of the British diplomat accompanying the Queen of the United Kingdom to broach the subject with his superior. “It was evident from his startled reaction that such an idea had never occurred to him,” Heinbecker writes. Derek Burney, also a former diplomat and anti-monarchist closely associated with the Mulroney government, told a similar anecdote in 2011 about a similar conversation with a British diplomat that occurred in the 1980s. First, the Queen of Canada only represents Canada abroad on and in accordance with the advice of her Canadian government because responsible government means that ministers of the Crown take responsibility for all acts of the Crown. For instance, the Queen of Canada represented Canada in France in 2007 when Her Majesty rededicated the Canadian war memorial at Vimy. Her uncle, King Edward VIII, also acted as the King of Canada when he dedicated our memorial in Vimy at its initial opening in 1936. The Queen of Canada has also represented Canada in the United States. 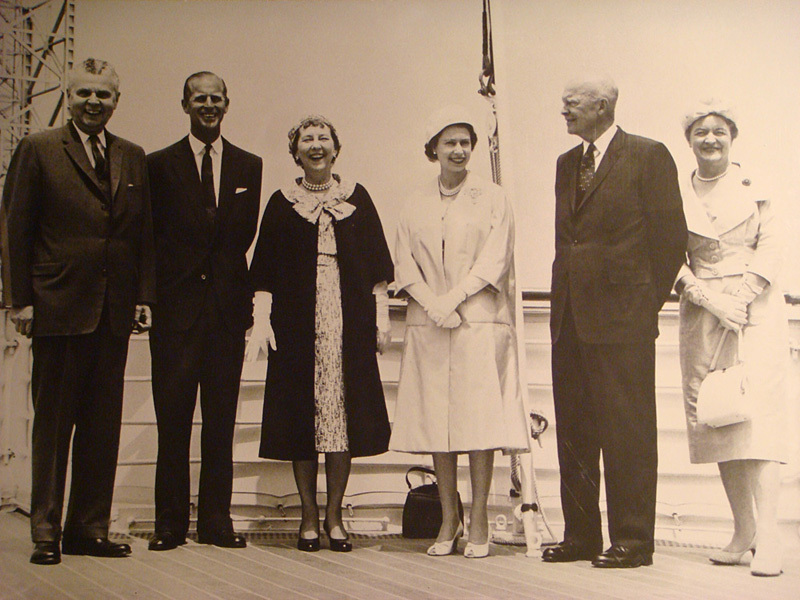 For instance, the Queen of Canada and President Eisenhower, each representing their respective countries, jointly opened the St. Lawrence Seaway at an official State ceremony in 1959. Second, the Queen only represents one Commonwealth Realm of which she is the sovereign or head of state at any one time on official trips abroad, apart from two addresses to the United Nations General Assembly in 1957 and in 2010. In 2010, the Queen said, “I address you today as Queen of sixteen United Nations Member States and as Head of the Commonwealth of 54 countries,” and the flags of all 16 Commonwealth Realms fly upon the Queen’s arrival. This procedure of representing only one Realm on a diplomatic visit during the conduct of official business avoids unnecessary confusion, but it does not derogate from the personal union of the Crowns. The personal union of the Crowns of the Commonwealth Realms always exists because Elizabeth II always personifies all the Crowns, but the personal union also imposes a physical limitation that the Queen of the United Kingdom and the Queen of Canada cannot speak with one voice. For practical reasons, the Queen does not act in more than one capacity at once. Her Majesty’s addresses to the United Nations General Assembly are the exception because of the nature of the UNGA itself, where representatives of all 16 Commonwealth Realms are gathered, and because the speeches did not contain anything controversial. Heinbecker probably intended to use this anecdote as some kind of ironic critique of the Crown of Canada, as in “What is the point in being a monarchy if the Queen doesn’t promote Canadian businesses abroad and only focuses on the United Kingdom?” In reality, Heinbecker’s anecdote relies on the fallacy of appeal to authority (that his role as a diplomat in and of itself means that the reader must take his account as unassailable), a complete rejection of diplomatic protocol, and on an objectively false interpretation of the role of the Queen of Canada under Responsible Government. Heinbecker defines the Crown as “a legal convenience and historical artefact in Canada, even a convenient fiction” as well as “an anachronism” to which Canada is “manacled” — as if the Crown were a ball and chain and symbol of colonial servitude. He also refers to Canada’s “link to the monarchy” – again, as if the one and indivisible Imperial Crown still existed and as if the Crown of Canada did not form an integral part of the constitution. A “link” could be severed with no complications. Heinbecker thereby dismisses the Crown of Canada’s centrality within the Constitution of Canada, particularly in sections 9 and 17 of the Constitution Act, 1867, which acknowledge that the executive authority of Canada is vested in the Crown, and that the Parliament of Canada, or the Crown-in-Parliament, consists of the Crown, Senate, and Commons. The Crown is thus integral to both the executive and the legislature. A vestigial anachronism cannot form the basis of the daily operation of the government and parliament. Despite describing the Crown as an anachronism, Heinbecker does acknowledge the fact that only an amendment under the unanimity formula of section 41(a) of the Constitution Act, 1982 could bring forth his Elitist Politician’s Republic in which the Governor General would subsume the Queen’s authority and functions and be elected by the 1050 elected representations in the House of Commons and provincial assemblies but only “from among the members of the Order of Canada.” (It is unclear whether the eligible pool of candidates for Governor General would consist only of the “Members” of the Order of Canada, or whether this would also include the two higher categories, Officers and Companions.) The Globe and Mail supported a similar scheme in the late 1990s. The struggle for righteous liberation from this tyrannical monarchy would give way to a new oligarchy wherein only elected MPs, MPPs, MLA, MNAs, and MHAs would possess the right to vote for Canada’s new head of state, and wherein only recipients of the Order of Canada would be eligible for election. This Elitist’s Republic of Canada would probably not resonate even within the republican movement! Canada’s ambassador to Germany wants Canada to become like Germany: he probably derived this method of selection from Germany’s parliamentary republic. The German president serves a term of five years, once renewable, and he is elected by a “Federal Convention” consisting of the elected members of the lower house of the federal parliament and “an equal number of members elected by” the parliaments of the 16 states. Currently, the Bundestag (lower house of the federal parliament) consists of 631 elected MPs, which means that the next President of Germany would be elected by around 1260 persons. Heinbecker probably wants to preserve or increase the Governor General’s independence by insulating him from the popular control and depriving him of a popular mandate. (In contrast, Ireland and Israel provide a different model of parliamentary republic in which the president serves as head of state but is directly elected by voters). On another note, what would become of the provincial Lieutenant Governors? Republicans tend to fixate on the Governor General and the head-of-state function at the federal level and to ignore the comparable function at the provincial level. Heinbecker does not indicate whether the Governor General would continue to appoint the Lieutenant Governors on the Prime Minister’s advice or whether they would be subject to a new method of appointment. Despite his argument’s logical inconsistencies, Heinbecker is right that the Queen of Canada’s role has been reduced in some ways. But the Queen of Canada has not been marginalized by the turning wheel of history or through the inevitable republican teleology; instead, successive Canadian prime ministers and ministries have chosen to marginalize the Queen in order to “Canadianize” the Crown and emphasize the Governor General. Heinbecker argues that Canada needs a government willing to lay the groundwork for a republic. This pre-republican government would “treat the Governor General as the de facto Head of State in all ways that the constitution does not actually prohibit” and ensure that the Governor General “performs the ceremonial roles of Head of State,” including the exclusive right to represent Canada abroad and to “promote non-partisan Canadian interests” abroad. In fact, the Governor General already represents Canada both at home and abroad, and the Queen of Canada exercises these functions infrequently. In practice and in law, most of what Heinbecker proposes already exists. By 2014, the Governor General of Canada already exercises virtually all the legal-constitutional functions of the Queen of Canada within and without Canada. The Queen of Canada now rarely represents Canada abroad because the Government of Canada rarely asks her to do so. Chris McCreery has shown how the Government of Canada gradually delegated most of the roles of the Queen of Canada to the Governor General of Canada from 1947 to 2005. Through the Letters Patent Constituting the Office of the Governor General, 1947, the King of Canada delegated (not “transferred”) the “exercise [of] all powers and authorities lawfully belonging to Us in respect of Canada.” The Queen of Canada remains the legal-constitutional source of all these powers and authorities; if the Office of the Queen ceased to exist, then all the Governor General’s powers and authorities would vanish with it. In practice, the Government of Canada did not ask George VI, and subsequently, Elizabeth II, to delegate the exercise of all the Crown’s powers and authorities until well after 1947. For instance, the Queen of Canada granted all letters of credence to Canadian diplomats until 1975; from 1975 to 2005, the Governor General did so explicitly on behalf of and in the name of the Queen. And from 2005 onward, the Governor General now issues them without direct reference to the Queen of Canada, even though she still personifies this constitutional authority. A more subtle example includes the Queen of Canada’s role as part of the Crown-in-Parliament (Queen, Senate, and Commons). 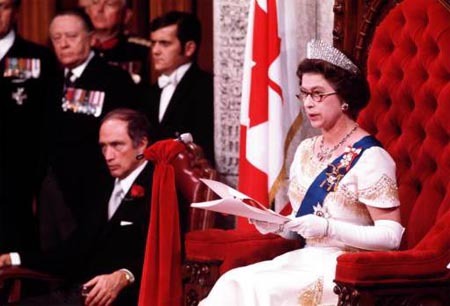 The Queen of Canada read the Speech from the Throne in the Senate in 1957; Prime Minister Trudeau invited her to do so again in 1977 as part of her Silver Jubilee. But in 2002 when Prime Minister Chretien almost certainly could have invited the Queen of Canada to read the Speech from the Throne as part of her Golden Jubilee Royal Tour, from 4 October to 15 October 2002, he instead allowed Governor General Clarkson to read it one week before on 30 September 2002. The Queen’s website also unfortunately lends some credibility to Heinbecker’s argument that Elizabeth II is perceived as exclusively British in a cultural sense. Elizabeth II dedicated the Canadian war memorial at Vimy as Queen of Canada, and not as Queen of the United Kingdom, in 2007, but the text of the speech appears under the “Official Website of the British Monarchy.” The website ought to reflect the personal union of the 16 Crowns of the Commonwealth Realms more effectively in this respect. The website does contain sub-sections for each Realm, but the banner “The Official Website of the British Monarchy” still looms large over the sub-heading “Queen and Canada,” which really ought to say “Queen of Canada.” The Canadian section includes sub-sections on “The Queen’s Role in Canada” (which would more accurately be “the Role of the Queen of Canada”), Royal Tours, a photo gallery, and “Symbols and Ceremonies.” The Queen of Canada’s website also ought to include a sub-section dealing with speeches that she has delivered in that capacity so that the text of Her Majesty’s re-dedication of the Vimy Memorial appears there. The Government of Canada now maintains a helpful website called “The Canadian Crown”; the Government could improve upon it by including the Queen of Canada’s speeches therein. While the Crown of Canada enjoys a secure legal-constitutional entrenchment under section 41(a) of the Constitution Act, 1982, the Crown of Canada as a distinct Canadian legal person has been delegitimated, more or less successfully, in the media and popular culture through a process well-known to scholars of nationalism and nationalist political discourse:”othering.” The Queen has become the foreign “other” so that the Crown of Canada can transform itself from the integral source of legal-constitutional authority to a foreign nuisance or distraction — and so that the good Canadian now assumes the duty to destroy this Other. Heinbecker argues that the government should “take down portraits of the royal family,” by which Heinbecker presumably means that the Government should take down all the portraits of the Queen of Canada from Canadian embassies as well as the portrait of the Queen from the Sovereign’s Wall in the Lester B. Pearson Building, because our embassies don’t display portraits of the whole Royal Family. Removing the Queen of Canada’s portraits from Canadian embassies and consulates would not alter the Queen of Canada’s legal-constitutional position as the sovereign (or head of state, if you prefer); however, this tactic of republicanism-by-stealth – the incremental and deliberate removing the outward symbols of the Crown that reflect Canada’s constitutional monarchy – is an effective method of delegitimating the Crown in the cultural sense. Elizabeth II is reputed to have said, “I have to be seen to be believed.” Each step in republicanism-by-stealth denies the Crown its rightful place in public view and ensures that Canadians no longer think of Canada as the constitutional monarchy that it is. A concerted strategy of republicanism-by-stealth and removing the Crown from everyday public view would make it easier for Canadians to imagine Canada as a republic so that they could perhaps one day will the First Federal Republic of Canada into existence. As Chris Champion showed in The Strange Demise of British Canada, these anti-monarchist neo-nationalists mean to create Canada anew. Canadian media often refer to the “British monarchy,” which implies that the one and indivisible Imperial Crown still exists and that therefore the Crown is inherently a foreign “other.” The phrase “cutting ties to the monarchy” often appears, and republicans like Duff Conacher of Your Canada, Your Constitution and Paul Heinbecker emphasize it; this wording implies that the Crown is nothing more than a colonial vestige that must, according to the republican teleology, inevitably consign itself the dustbin of history after collapsing under the weight of its legal fiction. While the current Constitution of Canada entrenches the Crown under section 41(a) in the legal-constitutional sense, the Crown of Canada will not necessarily sustain itself automatically in this cultural sense. Even maintaining the status quo requires active effort. In this case, those who favour constitutional monarchy must point out that the Crown of Canada forms an integral part of Canada’s legal-constitutional framework, and that we are merely drawing attention to and reinforcing the current fact and not “retrogressing” backward to some “colonial” subservience. It is the republicans who are the radicals, and the onus rests with them on why we should abolish the Crown of Canada. Constitution.ca states that it will focus on, among other things, questions relating to “the role and method of selection of Canada’s Head of State” – which at first instance sounds awfully like a republican argument couched in deliberately ambiguous language. Upon further analysis, the website confirmed my suspicion: under “Publisher Info,” Constitution.ca indicates that it “is published by Your Canada, Your Constitution” (YCYC). In Newspeak, Constitution.ca describes YCYC as “a research and education foundation dedicated to developing knowledge of Canada’s constitution.” In plain English, YCYC advocates that Canada become a republic, and therefore destroy the Crown by replacing its executive, legislative, and judicial authority with a new fully codified constitution. (I have documented YCYC’s mendacity and push-polling in previous entries). Sean M. Maloney, Canada and UN Peacekeeping: Cold War By Other Means, 1945-1970. (St. Catherines, Ontario: Vanwell Publishing Limited, 2002), 67. Richard Berthelsen, correspondence with author, 24 July 2014. Anne Twomey, “Responsible Government and Divisibility of the Crown,” Public Law no. 4 (2008): 742-767. Chris McCreery, “Myth and Misunderstanding: The Origins and Meaning of the Letters Patent Constituting the Office of Governor General, 1947,” chapter 3 in The Evolving Canadian Crown, edited by Jennifer Smith and D. Michael Jackson, 31-56 (Kingston-Montreal: Queen’s-McGill University Press, 2012). This entry was posted in Crown (Powers and Office), Monarchism v Republicanism, The Personal Union. Bookmark the permalink. As a purebred 2nd generation brit who competed for a duke of edinborough award and uttered my oaths of fealty to the crown on multiple occasions in my youth, and who has also studied political science for years at Concordia and since, I enjoin with others who celebrate the imperial connection with its rich traditions of peace, order and good government. I salute the monarch, and long may she reign. I concur with others here who affirm that it is no contradiction to consider a post-constitutional monarchy status for Canada an inevitable evolution when Elizabeth dies, a culmination of a process that started with the granting of responsible government through changes in the imperial relationship in 1919, 1931, 1948, and 1982. A transition of the GG’s position into an elected ‘Chancellor of Confederation’ should be envisaged and planned for, as we likely have less than a decade before our greatest, longest-reigned and final Monarch makes her final departure from the realm. The Canadian Crown and our Sovereign have been the only aspects of this Country that have managed to swell some Canadian pride within me as Ukrainian Canadian. Her Majesty makes me proud to be Canadian. Say there Brett,why not move to Britain.Then your chest could reallyswell with pride.You could have her majesty 24/7-not just when she deigns to pay us a visit. Where do you come off telling Brett to leave this Canada which he loves. You’re clearly the one who doesn’t love this great country of Canada as it has existed for 519 years, and so you are welcome to leave it. Perhaps George Washington Land would be a country more to your liking. But wouldn’t adopting a republic allow for a country to gain more legitimacy in the modern age? Surly staying with the old simply makes Canada look foolish for being old fashioned. I don’t know how young you are, but I’m in my 40s and I’ve learned through life experience how important ‘national heritage’ is in keeping a country united. Canada is essentially an Empire within a Country, and she needs as much forces of national unity as possible. As I noted in my other Post, republics have nothing but politicians to unite them. If you’re as up-to-date on American affairs as I am, then you know what a regionally and socially / ethnically divided country that is. These are the divisions which afflict every republican society, and they descend into ethnocentrism and ethnofascism. In America it’s White, Black and Latino. Note the Quebecois in Canada who don’t believe in our Royal & British Heritage, but are only unified by their French ethnicity. You should only advocate republicanism if you believe that English Canadian Society — as well as British, Australian & New Zealish Society — is worse off than Quebecois and American Society. Without hesitation, as someone of maternal Quebecois descent, I boast about the superior qualities of Anglo-Saxon Society which is united together by the Windsor Crown & Monarchy. The American obsession with our Monarchy is the proof of what a great thing we have! One thing I love about Canada is that it is a New World Country firmly rooted 1500 years in the Anglo-Saxon Old World. America’s Founding Fathers chose nihilism in creating their country, but Canada’s Fathers of Confederation — who met 150 years ago this year in Charlottetown (named after King George III’s Consort Queen Charlotte) — most definitely did not! Terry, Canada’s head of state should be a Canadian-or at least someone who lives here.The current one doesn’t meet that simple requirement.She’s basically a foreign and non-resident national and that’s why neither she nor her individual successor should be our head of state.The Brits. can keep her if they want. You express a xenophobic attitude which is the same mentality as that of the Quebecois Separatists and the Alberta Separatists (who are few in number). You want Canada to separate from our Family of Windsor Countries because you don’t want to have to share our Monarch. Those Separatists want to separate because they don’t want Quebec or Alberta to share a Government with the rest of Canada. This type of nihilistic thinking is abjectly destructive. Unfortunately, the mistaken belief that the Queen of the United Kingdom is queen of all the Commonwealth realms is not limited to Canada – it is all too prevalent in Australia too. One of the more ridiculous examples of this is the following story published by the ABC this week. In it an associate professor makes the claim that Scottish independence could create a constitutional crisis in Australia, leaving it without a head of state. He says this could be the case because the ‘sovereignty of the United Kingdom’ would no longer exist. Of course, this entirely ignores the development of the separate Australian crown(s) over the course of the twentieth century. Bizarrely, he also talks about the complications of changing the succession laws, requiring legislation across multiple jurisdictions. However, he doesn’t seem to realise that this process would be entirely unnecessary if Clause 2 of the Commonwealth of Australia Constitution Act 1900 (‘The provisions of this Act referring to the Queen shall extend to Her Majesty’s heirs and successors in the sovereignty of the United Kingdom’) was to be read literally and without reference to subsequent constitutional developments, exactly the state of affairs on which his whole argument relies! Even if we were to put aside the issues around his claims that the Queen of the United Kingdom is Australia’s head of state, his argument falls apart on another significant point. He entirely ignores the fact that the United Kingdom has already changed since Federation. If Scottish independence would provoke a constitutional crisis in Australia, why was Irish home rule and subsequent independence (first under a distinct Irish crown and later a republic) of no constitutional consequence to Australia? As always great article looking forward to the next one. A well-written and logically argued rebuttal. You have to like it when a writer argues against himself as Heinbecker does. Paul Heinbecker is one of the executives of ‘Your Canada, Your Constitution’, and he will concoct any reason he can think of to trash the Monarchy which he loathes. He also criticized the National Government’s cost-savings decision to share some Embassies with Great Britain as we had previously done with Australia. He and anyone else who wants to argue Canadian republicanism must first and foremost declare that they believe the United States to be a better country than Canada. If they don’t believe that to be the case, then they intrinsically acknowledge that republican society is deficient to monarchical society. In republican society the ‘citizenry’ comes first before the country, but in monarchical society the ‘country’ comes first before the citizenry. The Monarch is the personal embodiment of the country, and allegiance to the country is commanded which makes monarchies more successful countries. A republic is a ‘community of communities’, but a monarchical state is a ‘nation of communities’ firmly united as one society. The differences (which I consider superiorities) between Canada & America and Belgium & France are because we are monarchical societies. Belgium is a cosmopolitan society compared to ethnocentrist and ethnofascist France. You can easily see the superior thinking of loyal French-Canadians in Quebec over the obtuse republican Quebecois. In a monarchical state, politicians are only the government — NOT the state. In a republic, politicians are both the government AND the state. Since politicians inherently cannot foster unity, and only create enmity, this causes republics to be socially and regionally divided. All republics are afflicted by hedonism and materialism. Other than Switzerland, Finland and post-1950s Germany, can you name a republic which is a ‘success’? There are no more corrupt governments in the World than Republics: Russia, China, America, India, numerous African and South American republics. Constitutional Monarchies are much better-governed countries: Canada, Britain, Australia, New Zealand, Netherlands, Denmark, Sweden, Norway, Belgium. Compare the peaceful Kingdom of Jordan to its neighbours Syria and Iraq and Egypt. English Canadian republicans are quite stupid if they think that Canada — an Empire within a Country — would improve as a republic. It would gradually drift apart just like the United States once did, and probably will again by the end of this century. Once the despot Putin is gone, Russia will break apart as well. Does Paul Heinbecker want Canada to risk this simply because he hates Monarchy? Hatred is always a bad emotion to act upon. If you haven’t already you should submit this article to the Globe and Mail for publication. They have a journalistic obligation to publish a rebuttal to Paul Heinbecker’s article, and you have written a stupendous rebuttal. The G&M’s obligation is especially true given the errors in his article such as his preposterous claim that he had the right to advise the Queen on behalf of the Government of Canada! HA! HA! HA! HA! HA! That claim is utterly laughable, and if the G&M doesn’t publish a rebuttal they are equally laughable as a media institution. Mr.Heinbecker can speak for himself but frankly I doubt that he hates the idea of a constitutional monarchy.I rather suspect that as a patriotic Canadian he simply doesn’t like the idea that our country’s head of state is a foreign-and non-resident-national. Firstly, you need to be forthright and truthful about your beliefs: you are a republican, and you unequivocally oppose the concept of ‘monarchy’. Even if the Canadian Monarch lived in Canada you would still oppose the Monarchy. Patriotic citizens are loyal to their country — they don’t seek to destroy it as Mr. Heinbecker does! Mr. Heinbecker is anglophobic. I was a republican as a teenager, but I renounced that thinking upon reading the British North America Act because I realized that republicanism is treason and nihilism. The Fathers of Confederation have left us a GREAT COUNTRY, and it’s too bad for republicans who don’t love our beloved Canada!